With an extension of 1.5 km of clear water and thin sand, Marbella beach is described as a paradise for surfers, fishers, and lovers of the sea. Considering the sudden urban growth of Guanacaste, the town of Marbella is the ideal place for those seeking for a remote and quiet place, but yet with natural beauty. Although its popularity is increasing, it offers one of the least crowded beaches in the area. Marbella beach is located 30 minutes by car from the Ostional Wildlife Refuge, one of the key nesting sites for sea turtles in the Pacific Coast. The nesting season runs from July to December, time when national and international tourists visit and appreciate this incredible natural phenomenon. Hundreds of thousands of marine turtles return each year to this beach to lay an average of 80 eggs, being the main attraction for tourists and a natural spectacle with great impact on the ecosystem. It is quite common to find tourists of different nationalities looking for a bit of solitude in Marbella beach. The bright green color from the lush vegetation contrasted with the intense turquoise color of the sea creates a beautiful scenery. Sunbathe laying on the sun while watching a family of spider monkeys jumping from tree to tree. Sloths are very common in this area as well, so keep your eyes open for these sleepy animals in the top of the trees. You will also be able to observe different types of birds, including toucans and magpies. For those looking for adventure, luxury, and the ones that are on a budget, there are all types of lodging in Marbella beach. There are camping areas, options of hostels and B&B. You will find different categories of Hotels with different price ranges according to the amenities as well as beachfront houses and villas for rent. There are many lots available to build your dream home. The mountains of Marbella are the highest point around, that’s why it also offers the best views! 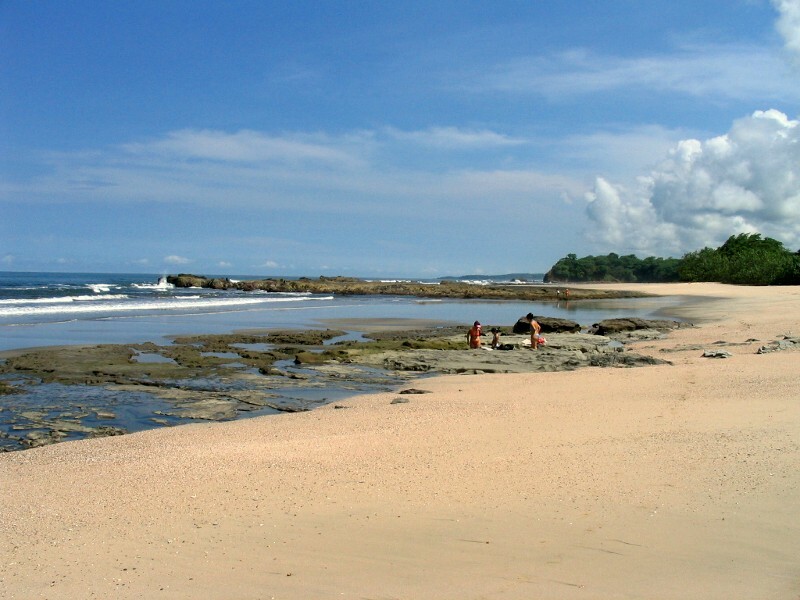 The extense and beautiful beach is also well known among surfers. Since winds blow against the sea there are more leisured waves, the main feature of the best surf spots in the world. Its conditions mean that only the most qualified and experienced surfers can tame the waves that can become quite big for some months. You can access the beach by bus car boat or walking, there is a ramp and path to facilitate the access of wheelchairs. If among your plans you are visiting an exotic place in Costa Rica, without a doubt Playa Marbella responds perfectly to that description. The perfect climate and relaxed atmosphere will make you fall in love at first sight.